Team up with the cast of CSI: Crime Scene Investigation to solve some of the most gruesome crimes of Sin City and take down a dangerous drug cartel. Partner with FBI agent Gene Huntby in five connected cases to take down the Queen of the Hive. The storyline engages you from the first case to the last. 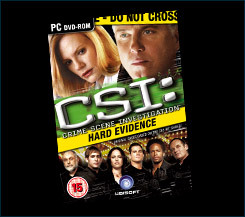 Be prepared to work with your CSI partners, including the returning Sara Sidle, to solve murder cases and uncover the Fatal Conspiracy behind the crimes you investigate. Fatal Conspiracy features intriguing cases written with the CSI show writers and heavily improved graphics including enhanced character acting and lip syncing with the voices of show’s actors. For the first time ever, team up with the new cast of CSI: Crime Scene Investigation™ Season 9 to solve Sin City’s most gruesome crimes. Explore five brand-new, shocking cases written with CSI writers and bring the guilty to justice. FEEL CHILLS RUN DOWN YOUR SPINE... while exploring crime scenes, dissecting a victim’s body, or following the twists of the story. 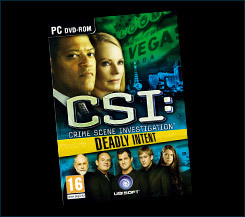 CSI: Deadly Intent is an all-new immersive experience thanks to intriguing cases written with CSI show writers, a new rendering engine allowing for more realistic graphics, improved lighting effects, and enhanced character acting and lip sync with the voices of the actors from the show. JOIN THE NEW CSI FAMILY... and partner with the cast of the new CSI Season 9. For the first time, team up with new characters such as Ray Langston (Laurence Fishburne) and Riley Adams (Lauren Lee Smith). PUT YOUR EXPERTISE TO THE TEST... as you play one of the most skillful forensic experts to join the Vegas CSI team. Join forces with the CSI team and tackle Las Vegas’ most disturbing murders– from a gruesome arson attack to a frenzied shootout. It’s all about the evidence, and more like the hit TV show than ever before. Break down the evidence and bring suspects to justice in five all-new, bizarre crimes. Master new forensic tools and find more evidence than ever. Use the new Garage Lab to examine large pieces of evidence like cars and trucks. Experience your very own CSI episodes as you piece together clues with the real CSI actors. Take part in dramatic interrogations, create grisly crime reenactments and explore atmospheric crime scenes inspired by the show. Join the famous CSI team in Las Vegas and investigate 5 all new cases using the latest forensic science. Work along side Grissom, Catherine and the entire cast as you utilize the latest crime-solving equipment. To discover the truth behind the crimes, you must visit the scene, interview suspects and collect and analyze physical evidence. Use puzzle-solving and interrogation skills to establish a relationship between the suspect, the victim and the crime scene. Investigate crime-scenes that are more like the hit TV show than ever. Feel like you are really using the tools for collection and detection of evidence and interact with the CSI cast like never before. Players will be drawn into the action with improved character interaction and longer more immersive cases. 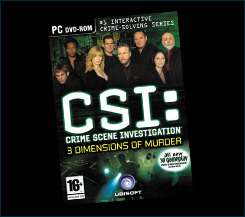 Just like the hit TV show, CSI 3 Dimensions of Murder features the Mobile Analysis Unit that can be used to analyze evidence quickly in the field. Work with your favorite cast members from the show. Use the latest forensic technology, such as fingerprint dusters and an enhanced microscope. Explore locations taken straight from the show. View video reconstructions of the crimes. CSI: Crime Scene Investigation in USA is a trademark of CBS Broadcasting Inc. and outside USA is a trademark of Entertainment AB Funding LLC. CBS and the CBS Eye Design TM CBS Broadcasting Inc. ©2000 - 2010 CBS Broadcasting Inc. and Entertainment AB Funding LLC. All Rights Reserved. Software © 2010 Ubisoft Entertainment. All Rights Reserved. 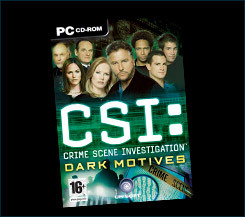 CSI: NY software © 2008 Ubisoft Entertainment. All Rights Reserved. Ubisoft and the Ubisoft logo are trademarks of Ubisoft Entertainment in the U.S. and/or other countries. 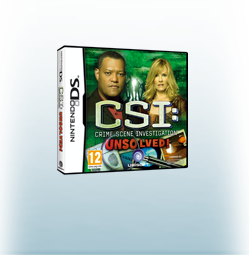 CSI: Crime Scene Investigation: Fatal Conspiracy console game engine © Telltale Inc 2010 All Rights Reserved. “PlayStation” and “PS” Family logo are registered trademarks and “PS3” and the PlayStation Network logo are trademarks of Sony Computer Entertainment Inc. Wii and Nintendo DS are trademarks of Nintendo. © 2006 Nintendo. Microsoft, Xbox, Xbox 360, Xbox LIVE, and the Xbox logos are trademarks of the Microsoft group of companies and are used under license from Microsoft. Software platform logo (TM and ©) EMA 2006.